It’s that time of year again. The game all Vikings fans dread, no matter how poorly the Bears are playing. Minnesota has won just twice in Chicago (2015 & 2007) in the past 10 seasons and the Vikings (2-2) will be traveling to Chicago on Monday night to take on the Bears (1-3) in their second divisional matchup of the season. 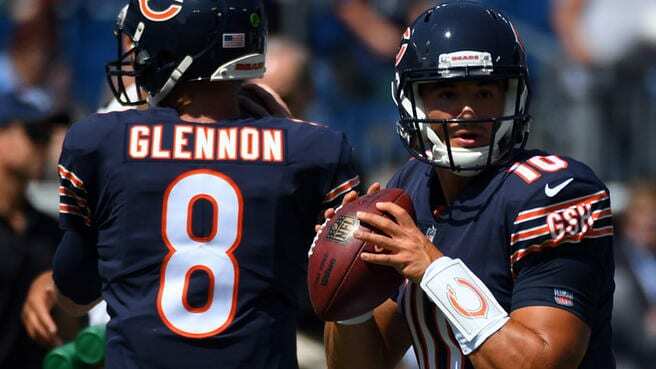 The Bears signed QB Mike Glennon in free agency this past spring and he’s already been benched, just four games into the season. That means the second overall pick in the 2017 NFL Draft, rookie QB Mitchell Trubisky (UNC) will make his first career start on Monday against Mike Zimmer’s defense. This is not a joke. If you go around and ask ten Vikings fans if they think the Vikings are cursed at Solider Field, 8-9 of them will probably tell you that they are. As I’ve already stated, the Vikings have won just two games in Chicago in the past 10 seasons. In 2015 Teddy Bridgewater completed a deep pass to Charles Johnson to put the Vikings in field goal range for the game-winner with just seconds remaining. In 2007, rookie RB Adrian Peterson went off for 224 yards and 3 touchdowns leading the way to a 34-31 Vikings win. Make no mistake though…it’s not just Minnesota that has struggled to get wins at Soldier Field. Chicago’s only win this season has come against a very good Pittsburgh Steelers team who beat the Vikings 26-9 just a week before. You could say that having home-field advantage definitely makes a difference for the Bears. Chicago is a different kind of animal at home, and Minnesota will look to shake “the Soldier Field curse” on Monday Night Football in front of a national audience. What do the Vikings need to do to beat the Bears on Monday Night Football? Welcome Mitchell Trubisky to the NFL: Rookie QBs are vulnerable and susceptible, mentally to start their careers. Very few, have what I call the “IT factor”. Being able to respond against a defense that pressures you consistently or throwing a touchdown, after you just committed a turnover allows a rookie QB to have the “IT factor”. I might be drinking too much purple kool-aid, but a guy like Teddy Bridgewater had “IT”. There’s a reason his nickname is “GUMP” (Great Under Major Pressure). Not many rookie QBs took as many sacks as Teddy did his rookie season, and even after all the hits he took or turnovers he committed, Teddy still found a way to lead drives and play his best when it mattered most. Does Mitchell Trubisky have the “IT factor”? We don’t know yet. But we’ll find out soon. Facing the Minnesota defense isn’t exactly an ideal situation for a rookie QB to be making his first career start. Vikings Head Coach Mike Zimmer’s defenses are historically good against rookie QBs. Guys like Carson Wentz, Dak Prescott, and Derek Carr have all struggled against Zimmer’s defenses in the past. Chicago is already a train wreck full of injuries and their wide receivers aren’t exactly the greatest threats right now. If Zimmer can find a way to make Trubisky feel uncomfortable early and often, the Minnesota offense should be able to score enough points to secure a victory against a rattled Trubisky. Win the field position game: The Vikings defense is one of the best in the league, and one category they really excel in is 3rd down defense. Last week the Vikings defense got off the field 10/13 times on 3rd down and recorded a season-high six sacks on Matthew Stafford. The defense played fairly well as a whole but failed to produce even one turnover. 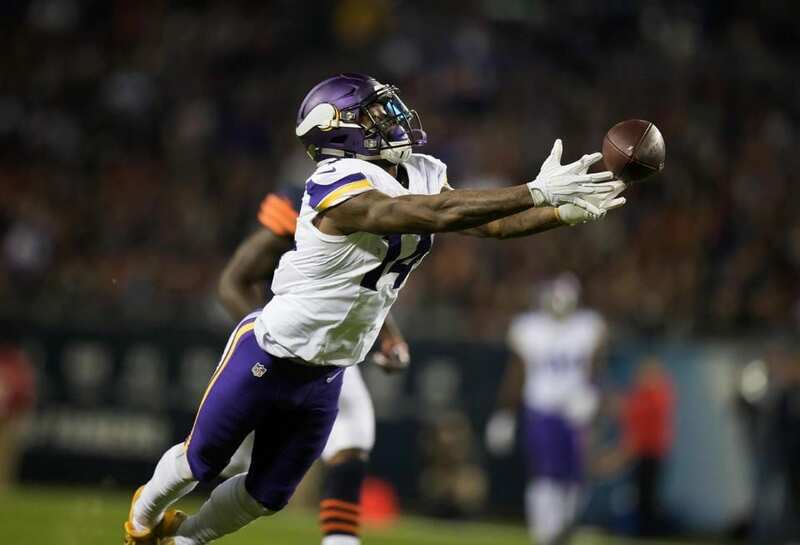 Xavier Rhodes, Anthony Barr, Trae Waynes, and Mackensie Alexander ALL dropped interceptions that would have set the Vikings up in good field position to put some points on the board. To put things into perspective…the Lions scored 10 points off of Vikings turnovers. Final score: 14-7. Had we not committed our two turnovers, we would’ve won the game. Mike Zimmer’s defense needs to take advantage of a rookie QB this week and create some turnover’s to improve the field positioning for the offense. And let’s face it…Marcus Sherels is bound to break loose a punt return sooner or later. He’s been held in check up to this point. Some help from the special teams would assist in our problem as well. Run defense needs to show up this week. Through the first 3 weeks of the season the Vikings run defense played exceptionally well and good enough to be ranked 3rd in the league. This past week, that aspect of our game failed to show up. Lions running back Ameer Abdullah had 20 carries for 94 yards and a touchdown. Had Abdullah not gotten dinged up, he would’ve almost surely run for 100+. This week the Vikings face the dynamic backfield duo of Jordan Howard and the “human joystick” Tarik Cohen. Last season the Bears added a rookie running back (Jordan Howard) and he ran for 153 yards and a touchdown in the first matchup. This season, the Bears added yet another rookie running back, who is nicknamed “the human joystick”. Youtube his college highlights once and you’ll understand why. If the Vikings defense plays the way they did last week in the run game, they’ll be in for a long night. Jordan Howard poses as a problem himself, but when you incorporate a back like Tarik Cohen who’s exceptionally shifty and a nuisance in the passing game, you end of having to game plan for both guys. Which packages or sets should Zimmer have on the field when Howard is on the field? Which players should Zimmer have on the field on 3rd down when Cohen is on the field? Game planning for two backs instead of single featured back issues difficulties. Using a guy like Anthony Barr as a spy on Cohen when he’s on the field is an option, but I’m curious to see how Mike Zimmer addresses these problems. Give me one Vikings prediction, one Bears prediction, and a final score prediction. Vikings prediction: Both Diggs and Thielen score a touchdown.Bears prediction: Mitchell Trubisky will throw for about 210 yards and a touchdown in his debut. It appears as if we won’t know who the Vikings will have under center until game day. Sam Bradford is practicing again this week on a limited basis but whether or not he’ll be ready to go on Monday night is unknown. Case Keenum is preparing as if he’ll be the starter again…as he should. I agree with Jacob. I don’t expect Mitchell Trubisky to go off in his first career start against a pretty stout defense, but I do think he’ll have a productive game. Trubisky has an element in his game that Mike Glennon doesn’t, and that’s his mobility. Trubisky can escape the pocket and extend plays with his legs. He’s also an effective weapon in play action as well. If the Bears can get the running game going, that should take some of the pressure off of Trubisky and allow him to go out and play his game. If he tries to do too much and beat Mike Zimmer’s defense by himself, he’ll likely fail miserably in my opinion. We will never know what it is. For whatever reason, the Vikings never play up to their potential at Soldier Field. This game always gives me anxiety and I always tell myself this is the year the Vikings put together a full game in Chicago. But……it never happens. The Bears have a really good running game with a solid interior offensive line and two quality running backs in Jordan Howard and Tarik Cohen. If they can get their running game going against Mike Zimmer’s defense it’ll open up the passing game as well. The Vikings are 22-3 under Mike Zimmer when they have scored at least 21 points in a game. The Vikings offense needs to be able to put points on the board against a defense who is without their leader in Danny Trevathan. Whether or not Sam Bradford is ready to go on Monday will make a huge difference. Vikings WR Michael Floyd has served his 4 game suspension and will be active for his first game as a Viking on Monday. Vikings rookie RB Dalvin Cook was placed on injured reserve on Thursday (torn ACL) and the team has signed RB Stevan Ridley to help fill the void at running back. The Bears will be without linebacker Danny Trevathan on Monday who is suspended for one game for his direct contact hit on Packers WR Davante Adams last week. My Bears Prediction: Tarik Cohen: 125 scrimmage yards and 2 touchdowns.